Everyone is talking about Trump. Whether you love him or hate him, the real-estate mogul is crushing his GOP presidential rivals in the polls. He is the darling of the press as they anxiously wait to see what wild and wacky thing will come out of his mouth next. Trump Tactic: Trump shot to the top by picking one issue and sticking to it – immigration. That was his nail and he hammered it home again and again. It’s even the only thing listed under “positions” on his website. Luckily for Trump (or perhaps, because of Trump), immigration is turning into a major issue in the 2016 cycle. Between May and August, the share of Americans saying immigration was the most important issue facing our country rose from 6 percent to 8 percent. Marketing Lesson: You’ve heard it before, but it’s worth repeating – If you try to be everything to everyone, you’ll end up being nothing to no one. And especially as digital marketing becomes more and more competitive, it’s increasingly important to have ultra-targeted ads and content. No matter if you’re selling software, advertising or cars, the best marketing has a very particular prospect in mind and goes after them with a laser focus. Trump Tactic: If you’ve heard anything positive about Donald Trump lately, it was probably about his refreshingly unfiltered banter. Mind you, it doesn’t make him any less offensive, but it is impressive to see a candidate who unabashedly speaks his mind. A perfect example of this comes from the first 2016 Republican Primary Debate. Moderator Bret Baier asked all of the candidates whether they can pledge their complete support to the GOP and promise not to run as an independent if they do not secure the Republican nomination. The crowd gasped and then cheered wildly as we saw Trump look down the line at his fellow hopefuls before unapologetically raising his hand with a smirk and a shrug. For perhaps the first time, a politician didn’t tell us what he thought we wanted to hear, he told us what he believed to be true. Marketing Lesson: Simon Sinek simply sums up authenticity as “the things we say and the things we do are the things we actually believe.” It turns out that consumers crave authenticity and honesty more than great customer service and more than innovative and unique product offerings. It’s an incredibly simple request, yet most brands, and politicians alike, fail to exceed or even meet our expectations in this area. Striving for authenticity in your content means defining your values and opinions and standing by them (warts and all) no matter what, while honestly divulging your practices. Trump Tactic: It’s hard to keep track of all the “haters” and “losers” that Trump is against. It started with Rosie O’Donnell and has since escalated to include Megyn Kelly, Mexican migrants, and pretty much any reporter he comes in contact with. Trumpites aren’t just rallying behind what he stands for, but what he stands against, and who is against him. Marketing Lesson: As marketers, we need to be great storytellers. And great stories are often powered by conflict. Steve Jobs was a master of creating drama in his brand story by positioning Apple as the noble underdog rising against the evil empires of IBM and Microsoft. Standing against as well as for something can give a brand a stronger point of view. Sure, it’s risky to create an enemy, but if you don’t stand up for what you believe in, you’ll go unnoticed. And what better way to state what you believe in, than by stating clearly what you DON’T believe in? Trump Tactic: From using Rosie O’Donnell as his favorite punchline, insinuating that he paid Hillary Clinton to attend his 2005 wedding and of course, taking a firm stance on illegal immigration, Donald Trump is clearly marching to the beat of his own presidential campaign. Trump is doing the exact opposite of what every other politician has been taught to do if they want to get results. But it’s working! Marketing Lesson: Amazon is one of the best examples of a company that got noticed by going against the grain. At a time when everybody thought the Internet was just a game, Amazon pioneered e-commerce. When everybody was obsessing over quarterly results, they stuck to a five-year profitability strategy. When everyone else was going vertical, they went horizontal. Take a bet on a new platform. Do something different. Many of my fellow marketing bloggers are focused on written content – blogs and ebooks – so we started a podcast that has now seen over 100,000 downloads. I’m also experimenting with Periscope to bring my writing to life more visually. Trump defended his business sense by stating that he is proud of his business record and that on the other hand, his experience with debt makes him empathetic and ideally suited to confront the challenges of the economy. Marketing Lesson: Four failed businesses out of hundreds is an incredibly solid track record when you consider that 9 out of 10 startups fail. Despite a few missteps here and there, Trump has managed to build his net worth to an estimated $4 billion, which is surely nothing to sneeze at. Investors agree that if an entrepreneur hasn’t failed, they probably haven’t been pushing the limits far enough and those who have faced failure are far less likely to fear it. As Trump demonstrates, it’s far more important to learn from your mistakes, maintain a positive attitude and rebound with integrity than to obsess over the failures of the past. Trump Tactic: Nowadays, we’re bombarded by messages left, right and center and, in the midst of all this communication, it’s all too easy for wires to get crossed. This can really get backs up, especially in politics. Trump prevents his proverbial messenger from being shot by simply not having one. He delivers his own, clear message. He completely owns his message, ensuring it’s received exactly as intended. In the clip here he gets a reporter who’d spent the first good chunk of her interview grilling him, to chuckle and blush (skip ahead to the 8 minute mark). Contrary to all traditional schools of thought on political campaign strategy and public relations. Trump is doing the exact opposite and also getting the exact opposite of what you would think: his numbers keep rising. Marketing Lesson: Not everyone starts out with an epic soap box to address the masses from. Not everyone has the PR firepower to get out there.. Many successful online marketers start off on someone else’s well-established platform, preaching to a borrowed audience. This is guest blogging, and it works. Why? Take a look at Trump. He may not be the most popular guy, but he has a strong message and he works hard to spread it on his own terms. Finding the right platforms to communicate a message you feel strongly about, is hugely beneficial to your blog or online business. Trump Tactic: Trump isn’t afraid to go where others wouldn’t dare. Yeah he has a few billion dollars to his name fluffing, freeing him from the need to conform to campaign financiers. He’s called politicians weak and ineffective, labeled America’s leaders as stupid, and ratted them out for being controlled by lobbyists. And that’s just the tip of his endless insults iceberg. But you know what? People are still listening. People crave the anti status quo politician; they want to hear something different from the usual mainstream mumbo. Marketing Lesson: Be the guy who sparks the response “ooh, did he just go there?” Swim upstream while everyone else is floating down. For instance, look at James Altucher’s success, even after mentioning he cried on the floor after losing millions of dollars. Not many people would have the balls to do that. What gets your blood boiling or your heart racing? What fuels your passions? Find it and then shout it from the rooftops. Stand proud, stand your ground and speak for all those equally passionate (and equally weird) people who are too afraid to say what you are saying and they are thinking. Being controversial is good. It means people are bothering to talk about you and that’s a win. Trump Tactic: The saying goes, “keep your friends close but your enemies closer.” Well it seems Donald Trump really took this one to heart. Two of his most costly foes are his two ex-wives. His divorce from Ivana Trump alone cost him a whopping $25 million in settlements. Most of us don’t have millions to lose (yet), so the real lesson is – build a strong network of likeminded people who can help you and your business to go further. Marketing Lesson: It’s not what you know, it’s who you know, and the better you know them, the more they can help you out. No marketer need be an island, infact you should be surrounding yourself with an archipelago of awesome online creators who you can learn from, bounce ideas off, and support each other through the good and bad times. Join online communities in your interest areas, reach out directly to your audience, follow similar blogs and websites and leave insightful comments on social media platforms. In business, your network can be an outstanding source for mentorship, referrals, and support. Make sure you’re surrounding yourself with the best people! 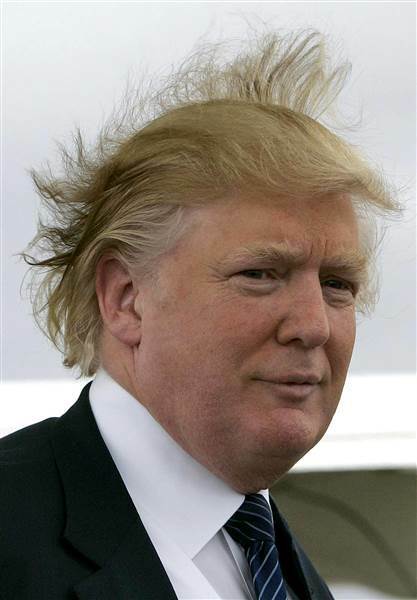 Trump Tactic: Take one look at those signature golden locks and there’s no doubt about it – Trump may have billions but he ain’t got a dime’s worth of style. His (80’s? 70’s?) throwback hairstyle may have more followers than him, with memes, fan pages and gifs all been created in its honor. But, despite his horrific hairdo, which he’s been criticized for by the media time and time again, what he lacks in style he makes up for in substance. People may not agree with every word he says but he definitely provides enough for them to chew on. His ideas and opinions are fully fleshed out. Marketing Lesson: Don’t just write clickbait-y headlines that lead to insubstantial content. Gone are the days when you can write a piece dripping in SEO keywords but devoid of rich content and with a complete lack in flavor. Google rewards content which is well-written, researched and backlinked by other credible sources. “Well, I’ll tell you what. With Hillary Clinton I said, be at my wedding! And she came to my wedding. You know why? Because she had no choice because I gave. I gave to her foundation that, frankly, that foundation is meant to do good. I didn’t know her money would be used on private jets going all around the world. It did”. There is a valuable marketing lesson in this one: don’t be afraid to dish out a little dough. Marketing Lesson: I’m not saying pay people have to come to your wedding or your son’s bar mitzvah, but in the online world, if you’re willing to give, you can get a whole lot more in return. Don’t be scared to spend a bit of cash. Paid advertising, such as Facebook ads, can be a great way to get traffic and leads. It helps to throw some fuel on the fire after you’ve validated a marketing funnel. Trump Tactic: Despite endless criticism from the media, in interviews and speeches, and in the Republican debate, Trump keeps pressing on with what he believes in. Marketing Lesson: Almost any meaningful business or marketing strategy can take months if not years to pay off. Like Trump you need to put down that luscious locked crown and just keep going. Content marketing takes a while to pick up steam, but once it does, that organic traffic will keep you sustained and help you go further than you imagined. Be patient! Trump Tactic: It’s no secret that the media hates Trump. Heck, even conservative media hates Trump. His disrespectful comments against (some) women, his bad mouthing of debate moderators and refusal to explain himself properly, doesn’t go down too well with them. But, despite all of this bad press, it doesn’t seem to be hurting his poll numbers – in a weird twist of fate it might actually be helping them – as he continues to lead the pack. Marketing Lesson: The point of publicity, whether or good or bad, is to get in front of your audience. In some form or manner, you are making a mark, and that’s usually a good thing. Guest blog, generate backlinks, share your content on multiple sites, and get more people to talk about you.